There are several theories as to the origin of the Scottish Rite, but it is known to evolve from France. Around 1754, a Chapter (or College) of Claremont was founded in Paris with seven degrees. By 1758 the system had become a Rite of twenty-five degrees known as the Rite of Perfection, whose Grand Regulations were issued in 1762. In 1786 “Grand Constitutions” were enacted in an attempt to bring order out of the chaotic condition of the degrees in Europe. It was these Constitutions which brought “The Ancient and Accepted Scottish Rite” into formal existence, enlarging the number of degrees to thirty-three, with the 33rd degree as a governing Supreme Council. Scottish Rite Masonry in the Valley of Duluth began four or five years prior to the establishment of the Bodies of the Rite in 1889. Frederick Doty, a Scottish Rite Mason from Minneapolis, was the Duluth ticket agent for the old St. Paul and Duluth Railway. Shortly after he had settled in Duluth, he suggested to several area Masons that they journey to Minneapolis to receive the degrees of the Scottish Rite. Siegfried Levy, Frederick Thomas Little and Edward Vail Mundy gave Doty their petitions, which he then sent to the Minneapolis Valley. These men were elected to receive the Lodge of Perfection degrees October 8th, 9th, and 10th, 1885. About this same time Cerneauism, a clandestine and fraudulent form of "mail-order" Scottish Rite Masonry, prevalent in Minneapolis and other portions of the state, attempted to secure a foothold in Duluth. The Cerneau Masons invited Brother Levy to join them at a cost of $25, promising that they would make him a thirty-third degree Mason and give him an office in the State Grand Consistory of Cerneau Masons if he would join. After a letter from the Secretary of the regular Minneapolis Scottish Rite Bodies explained what Cerneau Masonry was, the Duluth brethren decided it was time to take preventative action. Discussing the problem with other area Masons, they secured the petitions of John R. Carey, D.W. Barnum, and T.W. Hugo who were elected to receive their Scottish Rite degrees on April 6th, 7th, and 8th, 1887 at the Minneapolis Valley. These men formed a nucleus to recruit other area Master Masons into regular Scottish Rite Masonry, thereby thwarting Cerneauism in Duluth. The 14th, 16th, 18th, and 30th degrees were conferred in Minneapolis while the remainder from the 4th through the 29th degrees were communicated. This group of men later received the 31st and 32nd degrees of the Consistory by communication on December 4th that same year. These last two degrees were still not conferred in full form in Minnesota, for some years thereafter. The first sojourning Scottish Rite Mason to join the group was Guy Wells, 32°, from Keokuk, Iowa, followed by Isaac Edwin West, 32°, from Dakota. Walter Van Brunt and G.G. Hartley received their degrees, including those of the Consistory, from the Minneapolis Valley, and Rish A. Gray received those up to the 14th degree. This small group of men represented regular Scottish Rite Masonry in Northeastern Minnesota. 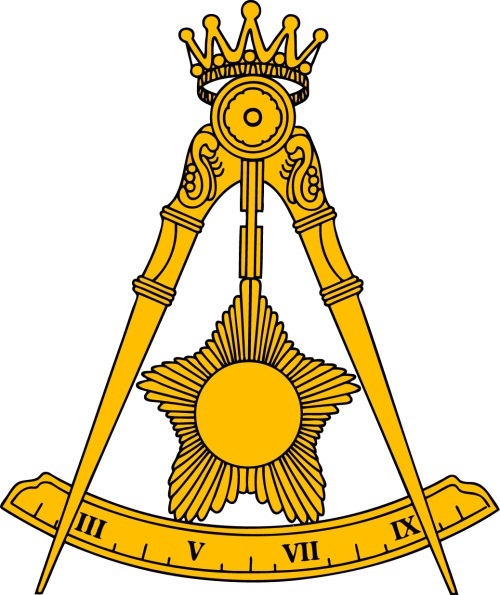 They decided that the best thing to do was to establish a Lodge of Perfection so that they would receive information about the Scottish Rite. Establishing a Scottish Rite body in Duluth, they began the traditional Maundy Thursday Feasts in Duluth. The first annual Maundy Thursday gathering was held in 1886 in the home of Brother Levy where his wife prepared the classical "lamb and green peas" meal. Brothers Levy, Mundy, Little, and Doty were joined in subsequent years by Brother Wells and other sojourners for the Obligatory Feast held upstairs of the old Grand Opera House at 4th Avenue West and Superior Street in Brother Levy's office. On March 26, 1891, the newly established Rose Croix Chapter assumed responsibility for the Maundy Thursday events, which were staged at the Temple Theater until l894. In 1895 the event moved to the St. Louis Hotel. From 1897-1904 they were held at the Spalding Hotel, and in 1905 they moved to the current Masonic Temple on Lake Avenue and Second Street. Early efforts to establish Scottish Rite in Duluth met with some opposition from Masons that did not want to organize another Rite in the area. They argued that no Northern Minnesotan had ever held any official position in any Scottish Rite Body. How could Duluth support yet another Masonic body, besides the Blue Lodge, with such a limited number of men in the area to hold office? To do a proper job of it would strain their human and financial resources. Their reluctance waned, however, as Brother T. W. Hugo began to exert great influence. In time, the majority agreed to organize a Scottish Rite body, and in 1888 they petitioned Illustrious Brother Samuel Emery Adams, 33°, Sovereign Grand Inspector General for Minnesota, to establish a Scottish Rite Lodge of Perfection in Duluth. The petition was signed by Brothers Trevanion William Hugo, Isaac Edwin West, John Richard Carey,Walter Van Brunt, Siegfried Levy, Delos White Barnum, Edward Vail Mundy, Guy Wells, Frederick Thomas Little, and Guilford Graham Hartley, all holding the 32°', and Rish Ayer Gray, the 14°. On the afternoon of Saturday, February 2, 1889, in the lodge rooms of Palestine Lodge No. 79, A.F. & A.M., on the third floor of the Hayes Block Building, then located on the southwest corner of Superior Street and First Avenue East, eight of the eleven petitioners (Little, Hartley, and Gray could not be present) gathered to organize the North Star Lodge of Perfection. Illustrious Brother Samuel E. Adams, 33°, Sovereign Grand Inspector General in Minnesota, was warmly welcomed by the small, but enthusiastic group. 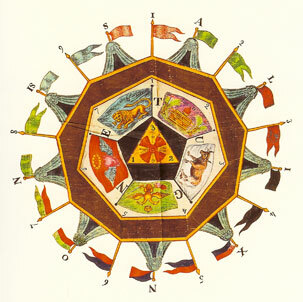 All eight had attained the 32°' in other Valleys and were to become the first charter members of North Star Lodge No. 6. Five days later, on Thursday afternoon, February 7, 1889, they met in the same location to communicate the fourth through the fourteenth degrees to the first class of candidates in Duluth. Nine Master Masons-Jerome Eugene Cooley, John Henry LaVaque, Charles McMillen, William George TenBrook, John Perkins Johnson, August Grochau, Harry R. Harvey, George Rupley, and William Eddy Richardson became new Perfect Elus and also charter members by special decree. The names of these nine men together with the eleven original petitioners appear on the "Letters Patent of Perpetual Constitution" for North Star Lodge of Perfection No. 6, a document signed October 23, 1890 in Washington, D.C. by Illustrious Brother Albert Pike, 33°, Sovereign Grand Commander, the most revered man of Scottish Rite Masonry. Following the advancement of the first class, Sovereign Grand Inspector General Adams then proceeded to institute a Lodge of Perfection. With the entire assembly voting, the following were elected the first officers of North Star Lodge of Perfection: T.W. Hugo as Venerable Master, Isaac E. West as Senior Warden, John R. Carey as Junior Warden, Walter Van Brunt as A1moner, John H. LaVaque as Orator, Jerome E. Cooley as Secretary, and Siegfried Levy as Treasurer. Venerable Master-elect T.W. Hugo, destined to lead the Scottish Rite Bodies of Duluth for the next 34 years, then designated the following brethren to fill the appointive offices: William G. TenBrook as Master of Ceremonies, Charles McMillen as Expert, Delos W. Barnum as Assistant Expert, John P. Johnson as Captain of the Host, and August Grochau as Tyler. Inspector General Adams then officially installed this slate of elected and appointed officers, and the new Lodge of Perfection was ready for work. The Lodge immediately became very active and several classes of candidates were initiated during the first year. As activity increased, it seemed as if Masonry in Duluth was about to outgrow its home in the Hayes Block. Meanwhile, a popular Duluth landmark and cultural center of that time used by the Scottish Rite was destroyed. The Grand Opera House of Duluth burned down in 1889. In An effort to create and a new Masonic home, the Masonic Fraternity of Duluth decided to erect a building that would be a substantial and artistic monument to the city and to themselves. They built the magnificent Masonic Temple, a six-story building on the east side of Second Avenue East and Superior Street that was to house their Temple, the Temple Opera House, and the first permanent Duluth Public Library. The cornerstone for the Masonic Temple was laid by the Masonic Fraternity with all the customary Masonic honors on August 28, 1889. The rear portion, the Temple Opera House, on which construction began earlier, held its grand opening October 2l-22, 1889. The event featured Miss Rose Coghlan, the great stage actress, who performed in her brother's play Jocelyn. The Masonic Temple, immediately adjacent to the Opera Theater, opened in the spring of 1890. It was an exciting time when Palestine Lodge No. 79 moved its quarters to one of the upper floors and the Scottish Rite established their headquarters over the Temple Theater at the rear of the building. 1890 was also a year of honors for the Rite. On October 2lst, T.W. Hugo, J.R. Carey, and I.E. West were all made Knights Commander of the Court of Honour. During the same evening, Inspector General Adams coroneted T.W. Hugo an Honorary Inspector General, 33rd Degree, the first Duluthian to receive this high distinction. The A.T.C. 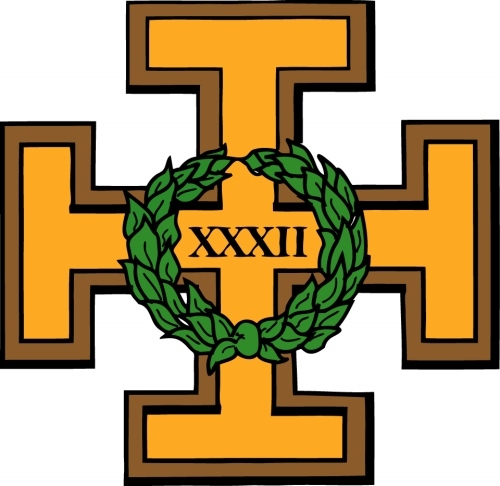 Pierson Chapter No.4 of Knights Rose Croix was founded by Brother Hugo on January 22,1890, with Sovereign Grand Inspector General Adams again presiding at the institution ceremonies. The Zenith Council No. 3 of Knights Kadosh was created the next day with elaborate ceremonies, and October 23rd that same year Duluth Consistory No. 3 was formally instituted. The "Letters Patent of Perpetual Constitution" for each of the four bodies were all dated October 23, 1890, and were signed by sovereign Grand commander Pike. Forty-five years later, with Supreme Council approval on October 23, 1935, the names of these first three Scottish Rite Bodies were permanently changed to "Duluth" to agree with the Consistory name. On January 8, 1891, Sovereign Grand Inspector General Adams came to Duluth and conferred for the first time the 31st and 32nd degrees. Following the degree work, the 32 candidates enjoyed a banquet and participated in the election of officers. Illustrious Brother Hugo had by now been chosen presiding officer of all four bodies of the Duluth Scottish Rite. No other brother would Preside over all four Duluth bodies of the Rite since that time until 1989 when Illustrious Brother Andrew E. Hagensen, 33°, become Master of Kadosh of the Duluth Consistory. Hard hit by the financial Panic of 1893, Duluth and the Scottish Rite began to recover in 1895. Then suddenly, at 1:00 a.m. on Sunday, October 13th, 1895, fire broke out in the new building destroying almost all of the Scottish Rite equipment, furniture, and costumes and causing considerable damage to their beautiful new rooms. This was a terrible blow to the Valley. When the Supreme Council, meeting in Washington, D.C., heard the news, Sovereign Grand Inspector General Adams obtained a complete set of duplicate charters to replace those lost in the fire. He also furnished the Valley of Duluth with duplicates of the rituals, music, and other printed matter that was lost. At this same Supreme Council Session, W.E. Richardson received the 33rd degree and T.W. Hugo, 33°o, received the Grand Cross, the highest possible honor of the order, as a mark of appreciation for work well done and services rendered in organizing the Valley of Duluth. The Grand Cross Jewel was later presented to him by the Supreme Council on April 2nd, 1896 in Washington, D.C.
A month after the fire, on November 14th, Brother Hugo opened a Lodge of Perfection meeting in the offices of W.E. Richardson, 33°, at the American Exchange Bank Building for the purposes of communicating the degrees of the Rite to the class who had been elected and received the 4" and 5' at the Masonic Hall. The sixth through the thirteenth degrees were communicated to a class of 11 members. Afterwards the Rite moved in with Palestine Lodge, sharing the front corner of the Temple Opera House building, until the present Masonic Temple on Lake Avenue and 2nd Street was opened in 1905. The Temple Opera House, or Theater,later became known as the Orpheum Theater and eventually as the Norshor Theater. Because of the enduring impact of the 1893 depression and the fire, the Masonic Fraternity eventually lost the Temple Opera House to their creditors. On May 30, 1899, Sovereign Grand Commander and Judge Thomas Hubbard Caswell, 33°, of San Francisco, California visited Duluth with Sovereign Grand Inspector General Adams to witness the 25th degree. This degree had recently been revised by Brother Hugo, who was a member of the Supreme Council Ritual Committee. Caswell and Adams both had great praise for the degree presentation that evening and were quite impressed with the Duluth interpretation. The present Masonic Temple, began in 1904, was erected debt free by a Temple Association which included The Scottish Rite Bodies of Duluth, Palestine Lodge No. 79, Ionic Lodge No. l86, Duluth Commandery No. 18 of Knights Templar, and Keystone Chapter No. 20 of Royal Arch Masons. The cost was $100,000. William A. McGonagle, 33°, Grand Master of the Minnesota Grand Lodge, A.F. & A.M., the first from Duluth, laid the cornerstone on August 10, 1904. Completed the following spring, the new Masonic Temple had its public unveiling on March 24th, 1905. The crowd of 2,000 Duluthians and visitors was so large that the musical program had to be given twice, first in the Blue Lodge room and later repeated to those in the Scottish Rite Auditorium. Past Grand Master W.A. McGonagle, 33°, gave the address of welcome to all assembled. On April 18th, 1905, Sovereign Grand Commander James D. Richardson arrived in Duluth. Joined in Duluth by Sovereign Grand Inspector General Adams, they pronounced that the degree work in progress was "well done" in a fine new Temple. Brother Richardson anointed Brother Rene T. Hugo, son of the Venerable Master, and other members of the spring class as new Masters of the Royal Secret. Brother Richardson consecrated this new Temple on August 19th and then, on the 20th, he was honored by over 400 Duluth Brethren at a Maundy Thursday banquet. Brother Richardson was the second Sovereign Grand Commander to visit the Valley of Duluth. 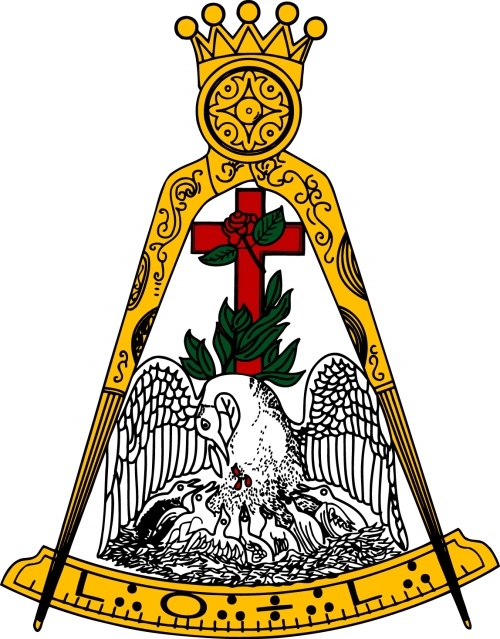 The first Maundy Thursday Obligatory Feast of the Duluth Scottish Rite Rose Croix Chapter was held on March 26, 1891, and "Relighting of the Lights" took place the following Easter Sunday. Traditional toasts at the Feast were given by T.W. Hugo, I.E. West, W.G. TenBrook, and WE. Richardson. Brother Hugo also read a telegram from Albert Pike, Sovereign Grand Commander of the Order, and J.B. Noyes spoke in behalf of the class of 1891. From their organization, until 1912, the founder of the Scottish Rite Bodies in Duluth, Brother Trevanion W. Hugo, 33°, was the presiding officer of all four bodies simultaneously. A man of great vision, enthusiasm, and organizing ability, Brother Hugo was nationally recognized as one of the most eminent Masonic scholars. Under his leadership the Scottish Rite Bodies of the Valley of Duluth became nationally known for soundness of organization, character of degree work, and for their altruistic activities. The Duluth Scottish Rite reached out to the community and to the world at large. The Temple became a center of Masonic social activities. In 1909, Sunday afternoon classical concerts on the new $12,000 Scottish Rite pipe organ were opened to the public. The Masonic Free Concert Season remained a popular attraction in Duluth for several years. On October 20, 1909, the Duluth Scottish Rite Bodies assisted in the organization of the Iron Range Lodge of Perfection in Hibbing, Minnesota. The Iron Range Brethren then would journey to Duluth to finish the work of the three remaining bodies. 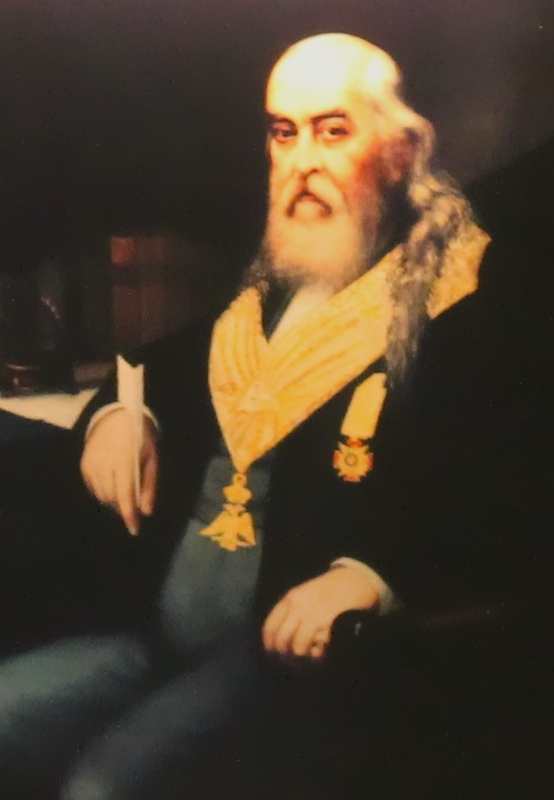 And in 1909, on the evening of December 29th, the Duluth Bodies invited Master Masons from the Masonic Lodges in the area to participate in the observance of the 100th anniversary of the birth of Grand Commander Albert Pike, 33°. Organ and vocal music selections a Masonic oration, personal reminiscences by T.W. Hugo, and selected readings of some of Brother Pike's poetry rounded out the centenary exercises. By 1914, the Duluth Scottish Rite membership had grown to 1,000. From the very beginning in 1889, charity was considered to be central to Scottish Rite work in Duluth. As Illustrious Brother T. W. Hugo wrote, their duty was "to extend the influence of our sympathies, broaden our charity, expand the sphere of our usefulness, assist, encourage and defend the Brethren, protect the oppressed, right the wronged, raise the fallen, relieve want and distress, enlighten the people and serve well the commonwealth, for this is Masonic work." Brother Hugo insisted that Masonry should not confine itself to the lodge room. He believed, "that the proper place for Masons to work was not necessarily within the tyled recesses of the Lodge, but in the highways and byways of life where many thousands of God's children were in dire need and many of them in despair." At first, the Rite's charitable work was directed by an elected Almoner and handled on an ad hoc basis. It was his duty to seek out worthy objects of charity, to visit the homes of those in distress and, wherever possible, to bring relief in the name of Freemasonry. To carry out his work, the Almoner had a separate fund over which he was responsible to his Sovereign Grand Inspector General. This pattern continues today, but with the passage of time, certain general programs of philanthropy have also emerged that require the efforts of the entire membership. The first of these became known as "The Well Baby Program" and was handled by the Infant Welfare Department. In 1910 when an epidemic of Cholera Infantum struck Duluth with disastrous effect, the Scottish Rite was very active in combating this epidemic. As a direct result of this experience, Brother Hugo conceived and established the Infant Welfare Department of the Scottish Rite Masons of Duluth, a clinic which began in a hospital tent with one fulltime nurse in charge. The aim of the clinic was not to treat disease but to keep babies well. Nurses and doctors were in charge of home visitation. The needy and poor of all races and creeds throughout the city were given a helping hand. Babies were examined by medical doctors and nurses who volunteered their medical skills while other volunteers helped prepare formula and keep records. Babies in need of special help were referred to their family doctor. Within a few months the clinic was moved to the Masonic Temple at Lake Avenue and Second Street. This approach proved successful and in a short time four other clinics were opened throughout the city, some in the basements of Masonic Temples. Mothers and prospective mothers came for advice, education and free pure milk for their children. Under the Infant Welfare Department, many health care professionals and volunteers gave freely of their time and skills. Remembered particularly were Drs. Olin W. Rowe, R.E. Nutting S.N. Litman, R.J. Eckman, G.O. Kohlbry, the Interns of St. Mary's Hospital, Chief Nurse Ida MacGregor and the many members of the Junior League. By spring 1959, over 210,000 babies up to 8 ½ years of age, had received assistance from the Duluth Infant Welfare Clinic system, but it became obvious that the need was greatly diminished. In 1963, the program was officially terminated after more than 50 years of outstanding service. So notable were the results of this program that statistics showed a substantial decrease in the infant mortality rate in Duluth. The death rate for babies, 122 pet 1,000 in 1911, dropped to 29 per 1,000 by 1935. While advances in medical science were responsible in a great measure for this change, the Scottish Rite's clinic system also played a vital part in saving Duluth children. The city government gave direct credit to the Masonic Fraternity for this great saving of human lives. The Duluth model for these clinics was adopted by many other cities around the country, some of them surviving into the 1960s until Federal Welfare legislation phased out their importance. Just eight years after the Cholera epidemic, another disaster struck-fire.In northeastern Minnesota, one month before the 1918 Armistice, a devastating forest fire swept through the area that destroyed entire communities including Moose Lake and Cloquet. More than 700 people died, 2,000 were injured, and tens of thousands were homeless and destitute when 1,500 square miles were consumed and over 4,000 homes destroyed. The October 12th, 1918 forest fire was one of the worst in the entire history of our country. The Masonic Fraternity did its part to help others, and once again, the Brethren had served their fellow human beings in need. Colonel Hubert V. Eva, 32°, K.C.C.H., head of the Army National Guard in Duluth, opened the Duluth Armory to the homeless and ran the State of Minnesota Disaster Relief Program. Past Grand Master William A. McGonagle, 33°, administered the Grand Lodge relief program, and Brother T.W. Hugo, 33°, Grand Chancellor, opened the Masonic Temple to the homeless and hungry refugees from the fire. The Supreme Council sent Brother Hugo $1,000 to be used for the fire relief effort. Only a change in the wind saved the city of Duluth, since the fire had already reached the outskirts. At Brother Hugo's own home, the sky above was solid grey smoke and the winds thundered for days. The family had to lengthen the garden hose to extinguish sparks on the cedar shingles of the roof blown into the center of town from the fire. Thursday, March 28th, l9l2 was a sad day for the Valley of Duluth. "Our friend is dead; our benefactor is no more," wrote Brother Hugo. Lieutenant Grand Commander Samuel Emery Adams, 33°, Sovereign Grand Inspector General in Minnesota, died at his residence in Minneapolis. He was affectionately known to the Duluth brethren as "Uncle Sam" and was dearly missed. Illustrious Brother Hugo was appointed the new Deputy of the Supreme Council for Minnesota on May 21st by Sovereign Grand Commander Richardson, and was crowned the Sovereign Grand Inspector General the following year on October 25th , 1913. When Grand Commander Moore resigned in 1921, the new Grand Commander appointed Brother William A. McGonagle of Duluth as Marshal of the Camp for the Supreme Council and, at that time, Brother Hugo attained his highest elected position in the Scottish Rite, that of Grand Chancellor of the Supreme Council, a position he held until his death in 1923. No Duluth Scottish Riter would be elected a member of the Supreme Council for the next 66 years until Illustrious Brother Daniel Frank Levenduski, 33°, became Sovereign Grand Inspector General in October 1989. Illustrious Brother Hugo brought the first chapter of DeMolay for boys to Minnesota and to the city of Duluth in December of 1920. Owing to his efforts, the Duluth Consistory of the Scottish Rite secured a charter from the national headquarters in Kansas City, Missouri and agreed to sponsor this chapter. Brother Hugo appointed Duluth Chapter's first Advisory Council headed by "Dad" Frank B. Carey, 32°', K.C.C.H. On April 16th, 1921, just two years after the formation of the Mother Chapter in Kansas City, Illustrious Brother Hugo, acting for the Grand Councilor of DeMolay, assisted by the Worshipful Masters of the five Duluth Lodges, instituted the first DeMolay chapter in Minnesota at Duluth. Fifty-one boys took the initiatory degree. After the work had been exemplified by the Advisory Council, the boys organized their chapter and elected their own officers. Brother Hugo served Minnesota DeMolay until his death on February 27th, 1923, as the State Deputy for the Supreme Council. The Duluth Bodies have maintained an unbroken sponsorship of this chapter for the last 80 years and have furnished many illustrious Masons for the Advisory Council to guide the boys' progress. Three of these brethren have gone on to head the state organization as Brother Hugo once did, and one, Dr. Ivan H. Northfield, 33°, became Grand Master of the International Order of DeMolay. Duluth's five Blue Lodges (Palestine, Ionic, Euclid, Lakeside, and Trinity) had a banner year in 1920. The Lodges experienced a phenomenal growth in membership – a net gain of 453 members, as contrasted with 131 and 264 the previous two years. Ionic Lodge, for example, held 66 communications that year with an average attendance of over 72 and raised 106 new Master Masons. Trinity, the youngest lodge, raised 156. The year 1921- would prove to be even better with 510 new Master Masons. A sixth lodge, Glen Avon, was planned for the Hunter's Park area. All the lodges were prospering and so was the Scottish Rite. The air in Duluth "buzzed" with Masonic activity. In March 1920, a third Grand Commander of the Scottish Rite, George Fleming Moore, 33°, journeyed to Duluth after a Reunion in Minneapolis where he dedicated their present Scottish Rite Cathedral, held a K.C.C.H. investiture, conferred the thirty-third degree, and participated in the Maundy Thursday Feast. In Duluth, he attended a Court of Honour dinner on Saturday and the "Relighting the Lights" ceremony Easter Sunday. Over 1,000 Masons were in the Duluth Scottish Rite Auditorium that morning to witness the impressive ceremony. Supreme Council Organist, Brother A.F.M. Custance, 33°, from Duluth, accompanied by the Scottish Rite double quartet, provided the music. It was a fitting climax to an exciting week for Scottish Rite Masons in Minnesota. The record-breaking membership year of 1921 for the Lodges generated added enthusiasm for the Scottish Rite. By December of that year, the Valley of Duluth had over 2,200 Scottish Rite Masons. Some of the brethren, beginning to become impatient, pushed the building committee toward providing new and more comfortable quarters. The crowded Temple could not effectively handle the class of 300 candidates planning to complete their degree work by Easter. And with all the other occupants of the Lake Avenue Temple, it was time to find a new home. The Valley owned the property at the corner of London Road and l3th Avenue East, across the street from the Duluth Armory in the Plaza area, and this seemed to be an excellent building site. Detailed plans were drawn-up for a bold, new Scottish Rite Cathedral for the Valley of Duluth. It was to be a modern four-story steel and concrete structure plus basement. The exterior was to be covered with white limestone and marble trim. The front of the building would face toward a city park which extended down to Lake Superior. The building would have a banquet hall that could seat 450, and the armory just 60 feet across the street seated 2,000. The new auditorium would hold 1,200, have a stage twice the size of the current stage, and could be rented for civic functions. There would be dressing rooms, robing rooms, club rooms, lounges, rehearsal rooms, a large library and candidates' room, storage rooms, and a large meeting room equipped in every way for the new Duluth Chapter of DeMolay. The Cathedral would also house the Infant Welfare Clinic with children's rooms, nurses’ quarters, and doctors' examination rooms. It was to cost between $500,000 and $600,000 and would be paid for by membership contributions in a fund drive. Completion was planned for 1923 with a projected spring class of 500 new Masters of the Royal Secret. Brother Hugo, who had served the Scottish Rite so brilliantly for many years, was a driving force behind the planned Cathedral. A civic leader as well as an active Mason, Brother Hugo served as an Alderman of the 4th Ward and President of the City Council for eight years, President of the Board of Education for several years, Mayor of Duluth twice from 1900-1904, a practicing and consulting mechanical engineer, an extremely active local historian, a Masonic scholar, the head of numerous Masonic organizations at the state and national levels, Grand Patriarch of the Grand Encampment of America for the Odd Fellows, President of the Minnesota Odd Fellows' Home in Northfield for 10 years, husband, father of two sons, and grandfather. Then tragedy struck! Brother Hugo died February 27th, 1923. His family, friends, and Masons from all over the country mourned. "His work was not finished, yet his column was broken." Even though the new Scottish Rite Cathedral would not be constructed, Duluth Masons would never forget T.W. Hugo, a man who served the fraternity for more than 50 years. Approximately 80 Duluth Master Masons erected a more lasting temple in his honor. Duluth's seventh Lodge, T.W. Hugo Lodge No. 318, was chartered in his memory. Illustrious Brother T.W. Hugo honored the generation in which he lived, and honors all members of the Duluth Valley for having passed this way before them. He served his fellow man with a generous heart and his daily life exemplified the high principles of the Masonic Order. He was indeed a "Soldier of Light," a man, and, in truth, a Mason. Brother Hugo's concern for the character development of boys must have inspired the brethren in the Valley to help other young men, for on November 6th, 1924 the Scottish Rite Bodies decided to sponsor the Boy Scout Troop of the Children's Home. The worldwide Boy Scout movement had only been in the United States for 15 years and in Duluth for 7 years when the Scottish Rite got involved. This troop was known as the "Eagle Patrol" or "Troop 33" in honor of the Scottish Rite. Initially nine boys joined under the leadership of the first Scout Master, Brother Felix Seligman. 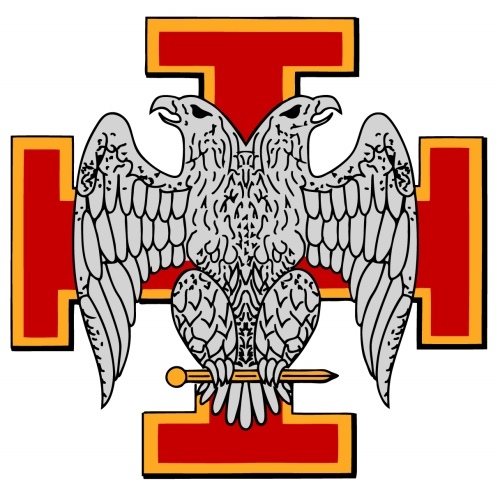 The Scottish Rite Bodies' sponsorship of Duluth Troop No. 33 of the Boy Scouts of America has been maintained since that time. Hundreds of Duluth area boys have benefited from the leadership offered in this active scouting program. The Scottish Rite also sponsored a camp located on Hunter Lake, for use by youth groups, including Boy Scouts, DeMolay, and Job's Daughters. The facilities of this 32-acretract, known as Camp Benkoski after its donor, Brother Frank J. Benkoski, 32°, have contributed to the development of many young people in our area through the years. Today the Scottish Rite continues to work with DeMolay and Boy Scouts. The Almoner continues to have the responsibility of representing the membership of this Valley in the dispensing of charities from the Almoner's Fund, which is created from voluntary contributions of our brethren. The Almoner, in effect, carries the perpetual "Light of Charity" for us, and in anonymity gives hope, cheer, and material aid to those in want and distress without regard to race, color, or creed. To facilitate its philanthropic and charitable programs, the Valley of Duluth established the Scottish Rite Foundation of Duluth on November 9, 1981. The Foundation was chartered as a private not-for-profit corporation under the provisions of the State of Minnesota Nonprofit Corporation Act, Minnesota Statutes, Chapter 17 on November 25th, 1981. Under the provisions of the United States Internal Revenue Service, the corporation was designated a 501(c)3 private foundation, permitting tax-free charitable contributions to the Foundation. The Valley of Duluth charter members forming the corporation and its first Board of Directors were: Daniel F. Levenduski, 33°, Clifford H. Grindy, 33°, Andrew E. Hagensen, 33°, Milan Grozdanich, 33°, Howard T. Hagen, 33°, John D. Morrison, 33°, H. James Harper, 32°, K.C.C.H., and Cedric I. Peterson, 32°, K.C.C.H. The first officers of the Foundation were: Daniel F. Levenduski, 33°, President; Clifford H. Grindy, 33°, Vice-President; Andrew E. Hagensen, 33°, Secretary; and Cedric I. Peterson, 32°, K.C.C.H., Treasurer. The first charitable effort of the Foundation was a Scholarship Program providing two full-tuition scholarships for students in any degree program within the College of Liberal Arts or the College of Science and Engineering at the University of Minnesota, Duluth. This began a relationship between the University of Minnesota, Duluth and the Scottish Rite. The scholarship program benefited many students, but as other scholarships became available through the local blue lodges with the help of the Minnesota Masonic Foundation, the Duluth Scottish Rite scholarship program was temporarily discontinued in 1984. 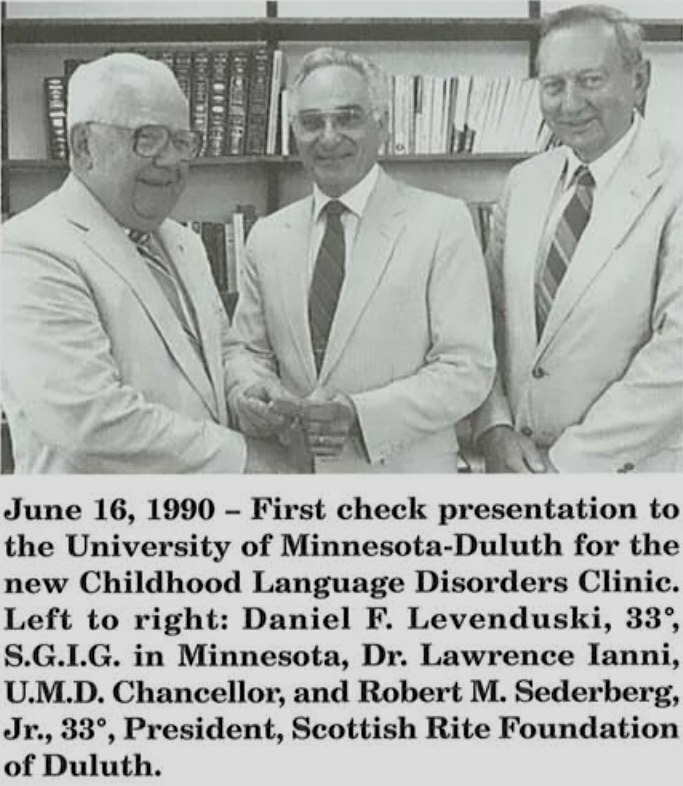 Subsequently the Foundation, inspired by similar efforts in other Orients of the Southern Jurisdiction, began plans to establish a Scottish Rite Clinic for Childhood Language Disorders in Duluth. In this facility professional clinicians, working with parents and children to develop their language and communication abilities, would help young children with communication difficulties to live successful lives. Consultation, assessment, and treatment for language disordered young people under the age of nine, regardless of creed, color, or national origin, with no charge to the family, would become a reality for children in this entire area. September 8th, 1990 was a festive day in the Valley of Duluth when two significant events were celebrated. The new Scottish Rite Clinic for Childhood Language Disorders, sponsored by the Scottish Rite Foundation of Duluth, the first in Minnesota, was dedicated on the campus of the University of Minnesota, Duluth. Heading the dedication ceremony was our Sovereign Grand Commander, Illustrious C. Fred Kleinknecht, 33°, Sovereign Grand Inspector General in Minnesota Daniel F. Levenduski, 33°, University of Minnesota, Duluth Chancellor Dr. Lawrence Ianni and Director of the Scottish Rite Clinic Carol R. Roberts, M.A., CCC-SLP. Distinguished guests at the dedication were: Grand Master of Masons in Minnesota Robert F. Papas, 33°, Sovereign Grand Inspector General in California H. Douglas Lemons, 33°, nationally renowned Hollywood actor Ernest Borgnine, 33°, Sovereign Grand Inspector General in Iowa Harry S. Barrows, 33°, Sovereign Grand Inspector General in South Dakota Marvin K. Bailin, 33°, and Deputy of The Supreme Council in North Dakota John H. Ramlo, 33°. Following the dedication, all in attendance were guests at a luncheon in the Scottish Rite Temple dining hall. Officers and Directors of the Scottish Rite Foundation of Duluth recognized at the clinic dedication were: Robert M. Sederberg, Jr., 33°, Clifford H. Grindy, 33°, Andrew E. Hagensen, 33°, Cedric I. Peterson, 32°, K.C.C.H., Howard T. Hagen, 33°, H. James Harper, 32°, K.C.C.H., John D. Morrison, 33°, and Mark T. Signorelli, 32°. On September 8th, 1990, the Northern Minnesota Masonic Celebration commemorating the 100th Anniversary of the Scottish Rite Bodies of Duluth was also held at the new Duluth Entertainment and Convention Center. Spirits were high at the well-attended Centennial Banquet with over 400 Brethren and feted guests at an elegant steak dinner. Earl L. Henton, 33°, was Master of Ceremonies and Ernest Borgnine, 33°", Hollywood, California, was the featured entertainment. The Centennial Committee headed by Donald B. Shank, 32°, K.C.C.H., as chairman, included Duane E. Anderson, 33°, J. Alfred Dillan, 33°, Clifford H. Grindy, 33°, Milan Grozdanich, 33°, Robert J. John, 32°, K.C.C.H., Andrew E. Hagensen, 33°, Earl L. Henton, 33°, Robert M. Sederberg, Jr., 33°, and Donald C. Wright, 33°. From its very beginning, the Scottish Rite Clinic continued a pattern of growth. With several part-time pathologists, volunteer assistance, and a budget of $20,000 in 1990-1991, it has grown to a staff of five CCC-SLP Speech/Language pathologists, an on-call ASHA Certified pediatric audiologist, an office manager and the Clinic director. The budget for the year 2001 is $160,000. Demand for clinic services continues to exceed our resources. It became obvious by 1999 that additional space was needed to house the growing clinic operations. The Foundation Board responded by acquiring a building at 28 West Second Street in June 2000 and, under the direction of Illustrious Glenn H. Liljegren, 33°, Personal Representative of the Sovereign Grand Inspector General in Minnesota, a new fully functioning clinic was in operation by September. With 2,200 square feet of space, the new facility consists of four therapy rooms, two observation rooms, an audiological sound suite, state-of-the-art equipment, a large play area, a spacious reception area, an outdoor playground and adjacent parking area. Thanks largely to Minnesota Scottish Rite Masons, interested foundations, grateful parents and Duluthians; the facility was paid for within a year. All Scottish Rite Masons in the Valley of Duluth may take pride in the organized philanthropic efforts that have served the public need, but we must not forget the untold story of brother helping brother in individual need when we remember the Almoner. Prepared by DUANE E. ANDERSON, 33° I.G.H. and ROBERT D. YATES, 33° I.G.H. Revised by David J. Vosen, 32° K.C.C.H.